In this Style Inspo I wanted to share some of my favourite street style looks from the Milan Fashion Week. All of the pictures were selected from the Vogue Street Style picks. Make sure to check out the gallery and tell me which your favourites are. Disclaimer: All pictures via Vogue !!! Great style! I love all the different looks! All these looks are stunning! Style inspo. Check out my Best Of Fashion Week article featuring AW16 runway hair and beauty trends! Fantastic collection of street style images! 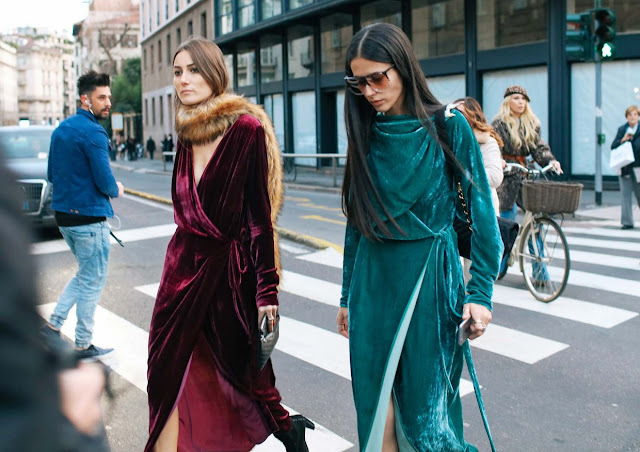 The crushed velvet matching dresses have really caught my eye, wow!! Love this! So much fashion inspo in one post! Those are very stylish fashion inspirations! Love them all! Love the streetstyle looks! So fashionable! Thank you for sharing these cool looks. I always need a flash of visual inspiration. I'm feeling the leather jacket with the fringe!